Coriander powder is derived from the seeds of the coriander plant. It adds a mild flavour and aroma to sweet and savoury food preparations. Most commonly, it is bought as whole dried seeds and ground as and when needed, but it can also be found as a readymade powder. To make coriander powder at home, roast it slightly without oil to enhance the aroma and then grind in an electric grinder or with a mortar and pestle. Ground coriander seeds lose their flavour quickly in storage; hence, it is best to grind as needed. One can crush coriander seeds finely or coarsely as per recipe requirement. • It is advisable to buy whole coriander seeds instead of coriander powder since the latter loses its flavour more quickly. • Always choose crisp and fresh seeds with a pleasant colour, which does not look too parched and dull. To make the powder, dry roast slightly and grind using a mortar and pestle or spice grinder. • If buying readymade powder, do so from a trusted grocer to avoid contamination. Check the seal of the package and the use-by date. 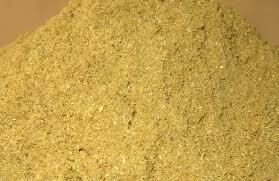 • A combination of coriander and cumin seeds powdered together is popularly used in Indian dishes. • Coriander powder is widely used in south Indian preparations, especially rasam, kara kuzhambu, vegetable preparations, etc. • It is an essential ingredient of many curries and gravies as it has a mild aroma that instigates the appetite. • Adding ground coriander to pancake and waffle mixes imparts a pleasing taste to it. • Put dry roasted coriander seeds in a pepper mill and keep on the dinner table so that you and your family can use them at any time on salads, soups and gravies too. • It will keep for about four to six months.